A watsu massage is aquatic bodywork. By combining massage, shaitsu, joint mobilisation, shiatsu. muscle stretching and dance, the watsu massage has the power to make you feel great. Performed with the guidance of a professional massage therapist, the watsu massage has many healing capabilities. We currently offer watsu massage in Los Angeles now. Call 310-867-4925 to schedule an appointment now! A typical massage therapy session is between 60 and 90 minutes. Your massage will begin with a brief consultation and review of symptoms, medical history, and lifestyle. You will be asked to change into a bathing suit and prepare a warm pool or large Jacuzzi. The massage therapist will position you in the pool to release the pressure and tension from your back. The massage minimizes grativity’s affects on the body and gives you a weightless feeling. Combined with a massage and you have a winning combination. Contact Kim at 310-867-4925 for further details. Massage will not be done directly over bruises, inflamed skin, unhealed wounds, tumors, abdominal hernia, or areas of recent fractures. If it’s your first time at the clinic, arrive at least 10 minutes early to complete the necessary forms. Otherwise, arrive 5 minutes early so you can have a few minutes to rest and relax before starting the massage. 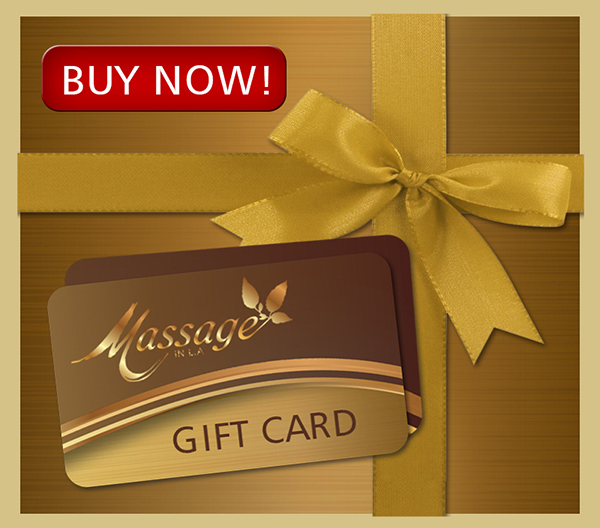 If you're looking for a special gift, therapy spa gift card is perfect!